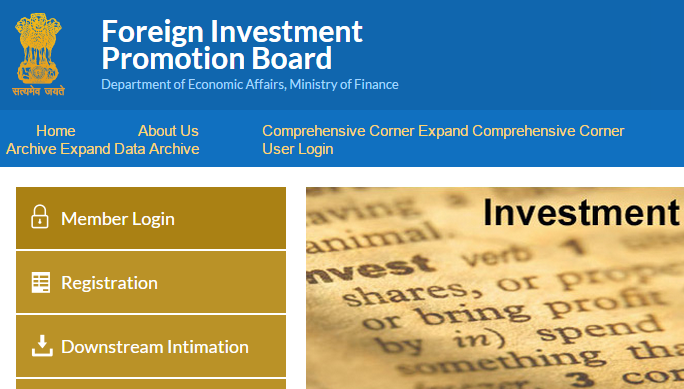 Department of Economic Affairs, Ministry of Finance launched here today a new upgraded and secure user friendly web site for filing and processing of applications for Foreign Direct Investment (FD) requiring Government approval. Presently the applications are filed online at www.fipbindia.com which had limited features and processing capabilities. The new website http://fipb.gov.in, which becomes operational from today, shall henceforth receive applications regarding FDI in approval route sectors. With the introduction of the new website, applicant will have to submit only SINGLE copy of the application for records with the FIPB Secretariat instead of 15-18 copies being filed earlier. Global Reach -Apply from anywhere in the world! Access your status from anywhere in the world! E-communication – communication between the applicant, FIPB and other ministries/ departments is online. Quicker communication– All the correspondence including updates/ decisions are communicated through SMS/emails and thus eliminating physical delivery and loss of time due to postal delays. Less Paperwork – Single signed copy only needed (for record) instead of present multiple sets of the application. SMS/email alert– Regular alerts are sent to the applicants related to the queries raised by the administrative ministries, inclusion of the proposal in the scheduled FIPB meeting and decisions. Transparency and security– all transactions and correspondences are recorded online and are secure. Query module- Any doubts? A user can raise a query online which shall be replied by the relevant ministry.